Venison paella or game paella are always tasty and rich rices. Start soaking the porcini in boiling water for at least 30 minutes. Pour the oil on the paella and when its really hot seal the venison, needs to take a nice golden colour. When the venison is ready add the asparagus and the broccoli. Leave it frying for 5 minutes and add the chopped garlic, its important that the garlic doesn’t colour to much or that gonna give a bitter taste at the end. When the garlic is ready and the porcini ( reserve the water of the soaking for the stock later) fry for 20 sec, add the smoked paprika 5 seconds and add the tomatoes grated. It is really important that the tomato get a brown colour before you add the water, this is what is gonna give the special flavour to your rice. Add the mushroom stock too and leave it to boil for minimum of 30 minutes. To measure the right amount of rice you need to do a line with the rice from one side to the other one and the mountain of rice needs to be 1 cm over the stock. Level the rice and distribute it in all the paella. We gonna make it boil hard for 8/10 minutes we can move the rice on that stage and be sure that the rice is distributed perfect on the paella, when the stock start to get thicker is the sign we need to low the heat. We leave it to boil for another 12 minutes, on that stage its important that we don’t disturb the rice more. 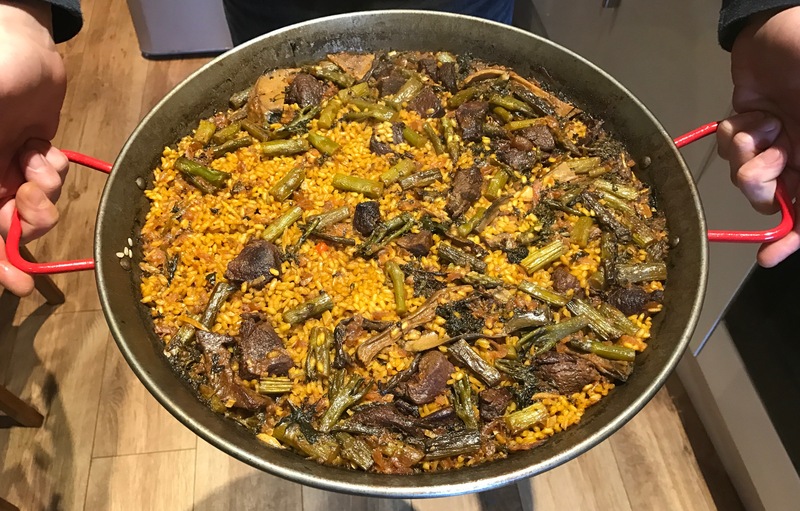 If in that stage you see that the rice get dry to soon is fine to cover the paella with foil to help the top grains to finish to cook. Leave it to rest for 10 minutes, mix it well and ready to eat.